As we all know nails aren’t just a cram of dead cells tucked in our fingertips, they also tell a lot about you and your health. Medical experts say that any nutritional deficiencies experience by a person can easily be manifested in the nails. The most common being the yellowing of the nails, often brought about by constant use of nail polish. Brittle nails, white spots and weak nails can be just few of the many manifestations of unhealthy nails. Well, experts would often suggest to always go natural and eat healthy foods to avert these disorders. While this is done to repair and make healthy the internal process of our body it is also equally important to choose the right products we use externally to maintain the healthy physical appearance of our nails. Nail files are just one of the many little things being used by manicurist to buff up our nails, but they can also cause further damage by splitting or cracking the nails. But did you know that Crystal glass nail file can reduce even eliminate this problem? Yes, they’re well made crystal product made by Mont Bleu from Czech Republic, it’s designed specially to prevent nails from splitting and becoming brittle. It’s gentle on hands and you can be sure that it’s 100% hygienic. Unlike the regular sandy nail files, this glass ones can brought and tucked in your bag anywhere you go without the worries of shame as it’s elegantly designed and can even be mistaken for a letter opener. There are a lot of gorgeous designs available for picking. So what are you waiting for get yourself a crystal nail file today and experience gentleness on your fingertips. 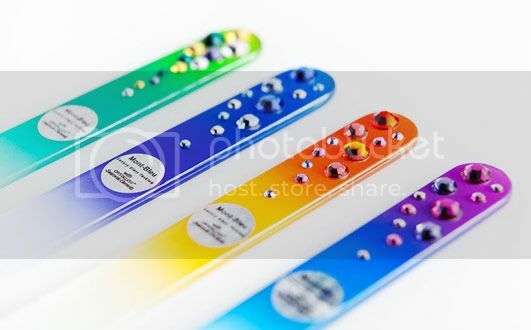 If you decide to buy for glass nail files today use the promo code BLOG and get 20% discount on your purchases and if you want more real-time updates, like their page at Facebook or follow Czech Glass nail files on Google+. If you have so much passion about nail fashion, this can also be a real opportunity for you. They’re open for Wholesalers and who knows you can make a lot of moolah out of your love for nails.